One of the most memorable things someone can get in the mail – and you can be the one to send it for Valentine’s Day. Your personal messages are hand-written on a bunch of beautiful potatoes, colorfully packaged and sent along with a nice card to your sweetheart, friend or family member. Great as a romantic gift – or just to let someone know you’re thinking about them. And yes, both ladies and gents love this! You do this and it will be talked about for a long, long time. Way longer than flowers. They’ll last longer, too! How does the Valentine’s Day Potato Bouquet work? 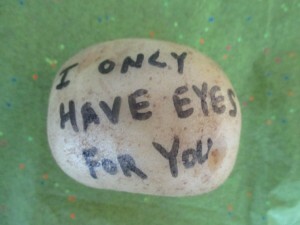 We pick out the nicest, freshest U.S. grown potatoes and hand-write your message on each one using a non-toxic marker. We arrange them and wrap them in Valentine red gift tissue paper. We include a premium note card (in an envelope) along with your personal message hand-written inside the card. There are are few extra options to add if you want (like glitter). We send it FAST via USPS Priority mail (1-3 days) and shipping is FREE. You can also choose a specific mailing date. It’s hilarious, surprising, fun and a guaranteed attention getter. Definitely something to make someone feel special. Note: This item ships to U.S. destinations only via USPS priority mail (1-3 days). Potatoes are fresh when sent. They are offered as a novelty, not as an edible food item. That being said, there is nothing wrong with them other than being written on with a non-toxic marker (easily peeled). Item may include a small flyer/insert inside. Let us know if you would like us to leave it out. Each potato has it’s own message. Type them below (6 or 12 depending on your order). 30 character limit per spud. Choose from a six-pack or a dozen. Includes a cute note card in an envelope with a Valentine’s Day sticker on it. What would you like us to write in your note card? Do you want us to add sparkly glitter or confetti to the note card envelope so that it spills out when they open it? Add a Valentine’s Day Card? Do you want a full-sized Valentine’s Day card added? This is a premium, full-sized (5×7) Valentine’s Day Card. You can upgrade it to a glitter bomb or confetti card so Valentine-themed glitter or confetti pops out when opened for a fun surprise. Your message is written inside and we put nice Valentine’s Day stickers on the envelope. These are sold separately for $9.99, so this is a sweetheart deal! If you selected a Valentine’s Day Glitter Bomb Card above, what would you like us to write inside it? You have up 350 characters. If you choose to ship it anonymously, we will use one of our unlisted U.S. mailing addresses. This is our default shipping option. We will not include any information about you inside or outside the package. We can ship as soon as it’s ready or we can hold and ship on 2/9 for a delivery closer to Valentine’s Day. We cannot guarantee a delivery date, just the day we send it.